Since many years I am actively involved In this very interesting issue. For this purpose I offer miscellaneous and practical support. Conducting wine funds successfully requires hard skills. On the one hand classical business abilities are in demand. On the other hand in contrary to other types of funds the guidance of wine funds requires a highly specialised knowledge about the wine business and the rules of the international wine markets. This cross is pretty hard to find. Those which like to invest in a wine fund should compare the offers of various providers very well. Beside aspects like duration and minimum amount of investment also asset-based fees and possible tax liabilities are of importance. The costs for administration as well as the required infrastructure of the fund including transport and storage got a huge influence on the rate of return. Most important is: It must be clear which due is fixed within the accessory charges for the initiator to pay for his idea and the realisation. In most cases unfortunately that due is calculated by far too high. Of course that cannot turn out all right for the investors. In case you intend to invest in a wine fund or to build up a wine fund yourself you should absolutly ask for advice with one of the very few people which are really knowledgeable in that very special type of business. Charlatans and self-proclaimed specialists one finds at every corner, but real professionals within this business are probably less than ten on this small planet. Don´t forget it: Nine out of ten wine funds finally are not successful. With funds specialised on German wines the quote is almost down to zero! These funds don´t allow making money but a good chance to loose a big part of the investment. Are wine funds a good investment? Under certain conditions investments in wine funds can be very interesting. Security and return on investment depend on the right qualification of general framework. If this framework is not considered in the right manner investors have to face a huge loss of their investment. In fact the big majority of wine funds can only show up with a abstemious or even a catastrophal performance. They are buying for the wrong price. 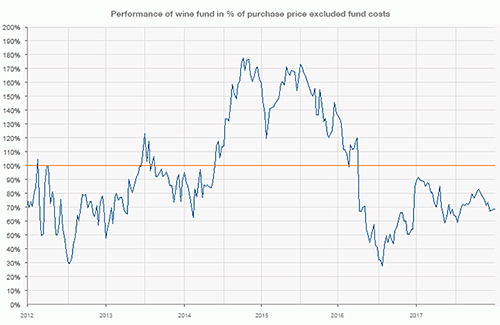 The fund management does not understand enough on wine for doing the right selection of wines. Who believes that being knowledgeable in economics in combination of being wine drinker himself since a long time is sufficient for investing in a wine fund or even for creating wine funds will have to face herb frustration. Recently again two bigger wine funds which have been praised in the beginning had to close down because of a zero performance. The biggest weakness of most wine funds is rooted in a wrong or even completly missing exit strategy. That means that at the end of duration funds own huge quantities of wines without having any sales strategy or distribution structure for placing these quantities in the market. Therefore the hypothetical increase in value can not be liquidated. In addition most wine funds have not been very realistic in calculating the real costs for transport and storage of wines.